Lydia Pallas longs for the security of home and family. With a talent for languages, she lands a job with the Navy Yard. Her living situation is threatened by the sale of her building. At the point of losing hope, an opportunity to translate for a mysterious visitor gives her renewed energy. Alexander "Bane" Banebridge shows up and disappears at the most unexpected moments. His work requires a translator, and Lydia fits the bill. He never expects to care so deeply for a woman, but marriage is out of the question. It would leave them both vulnerable and in danger. 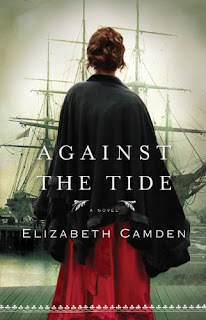 Elizabeth Camden is a new-to-me author. I'm glad I picked up this book and sampled her writing. Her story has the right balance of suspense, history, and romance. It was startling to learn about the opium trade during this time period and how medicines for infants and children contained this addictive substance. There's also a strong spiritual thread skillfully woven into the tale. I'm giving this book 5 Stars. Disclaimer: Neither the author nor the publisher paid me for a review. All opinions are mine and mine alone, as usual. Writers: If you plot your stories, how do you balance the different elements? Readers: Are you a fan of historical novels that highlight social issues? Please share.